It’s been a relaxing fortnight, after the fantastically busy garden open weekend, I thought I would have a break from serious gardening. I’ve potted, sat and enjoyed the view. I didn’t even think I could do justice to a post. So here I am back again full of enthusiasm and buying plants again. I’ve even got some visitors coming back this week for plants that were ordered. In this last two weeks the garden has truly come alive. 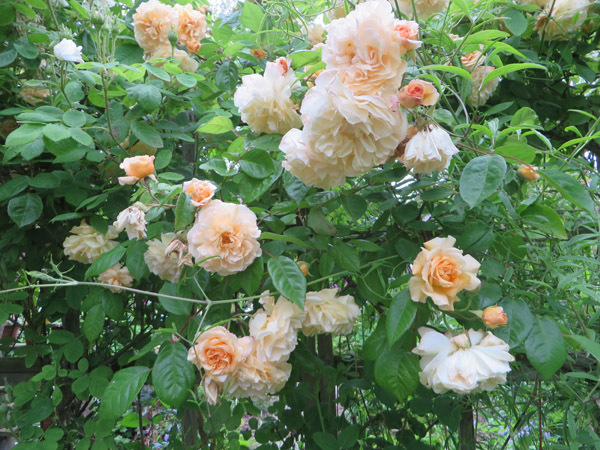 With 54 different roses in flower and lots of peonies, daylilies and many other perennials now filling all the remaining spaces. 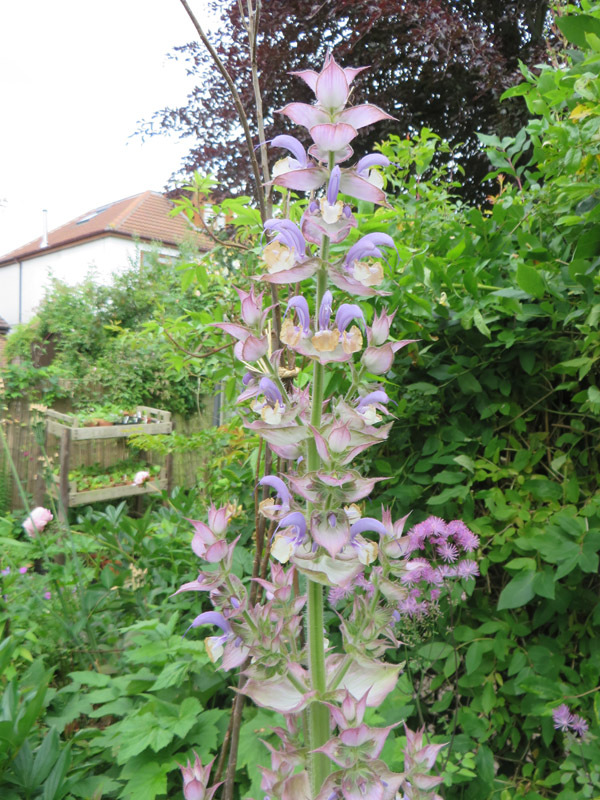 Salvia sclarea looking magnificent, I often see these in walled vegetable gardens but have never grown them until now. I got the seed from a seed swop locally last year and this is the result. I will save seed again as it is so impressive. Another unsown seedling. 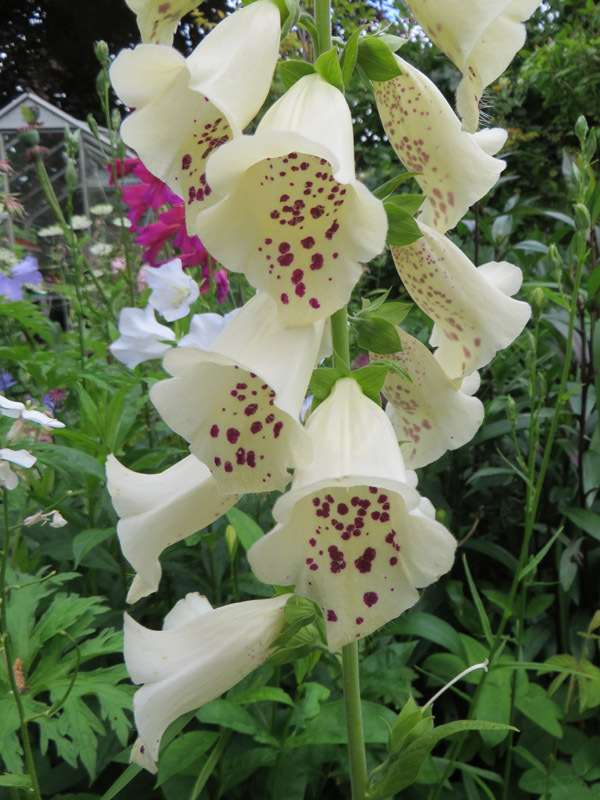 I grow pure white foxgloves but this is a beautiful rogue. Iris Ellenbank Damselfly I just love the markings and it’s delicate colouring. 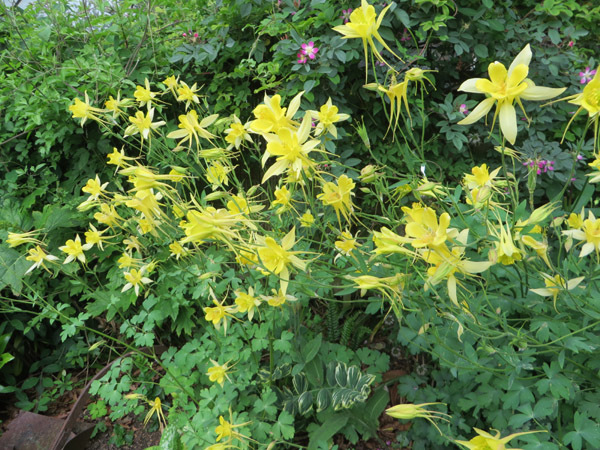 Aquilegia longissima. This is seed from L and G ‘s garden there it grows to only about 50cms as it is growing in poor soil on their drive. 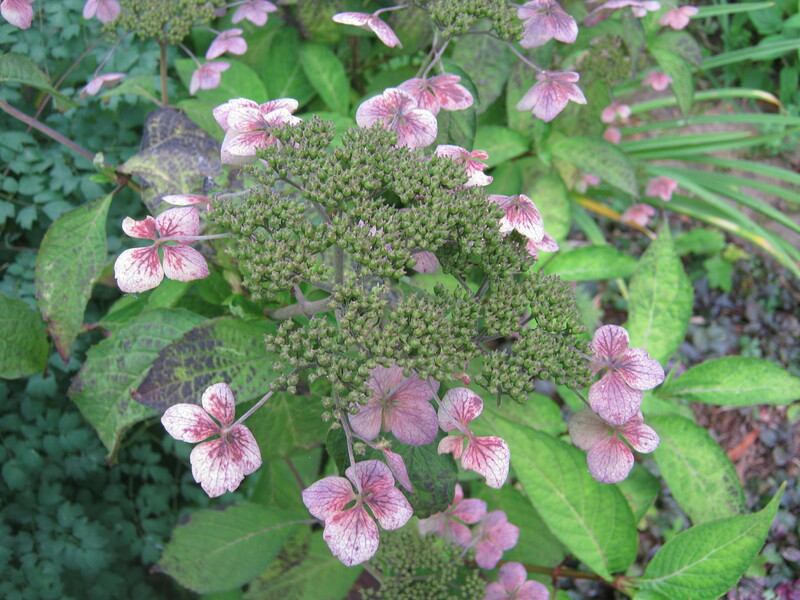 Here it is in my secret garden, semi shade good soil and more than a metre tall. They will have to be moved later in the year, but they do look good. 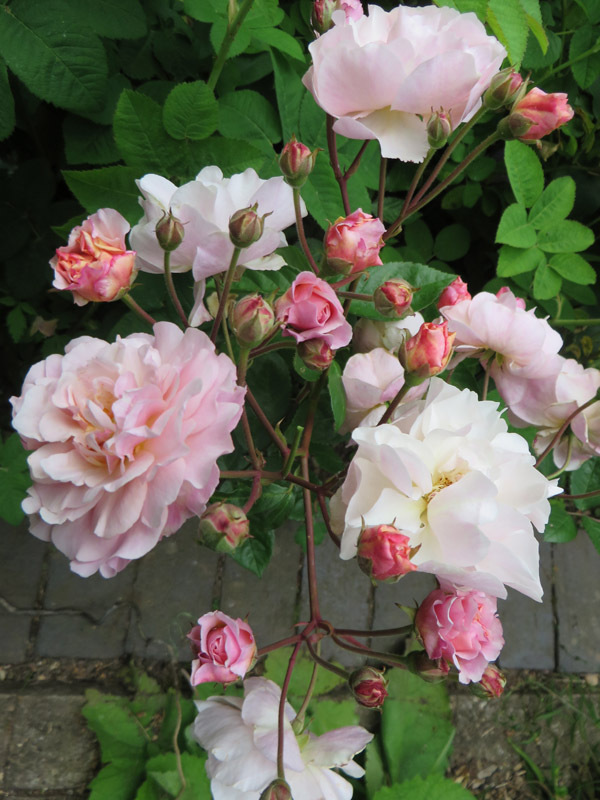 Roses…for many years along with several other plants these have been my passion. I now grow far less than I use to. Mainly because quite a few got old and past their best so I discarded them. Some didn’t perform as I would have liked either. 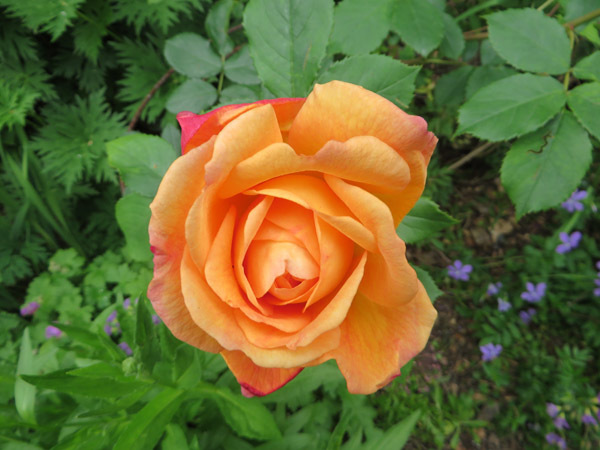 So now I grow around 70 roses. 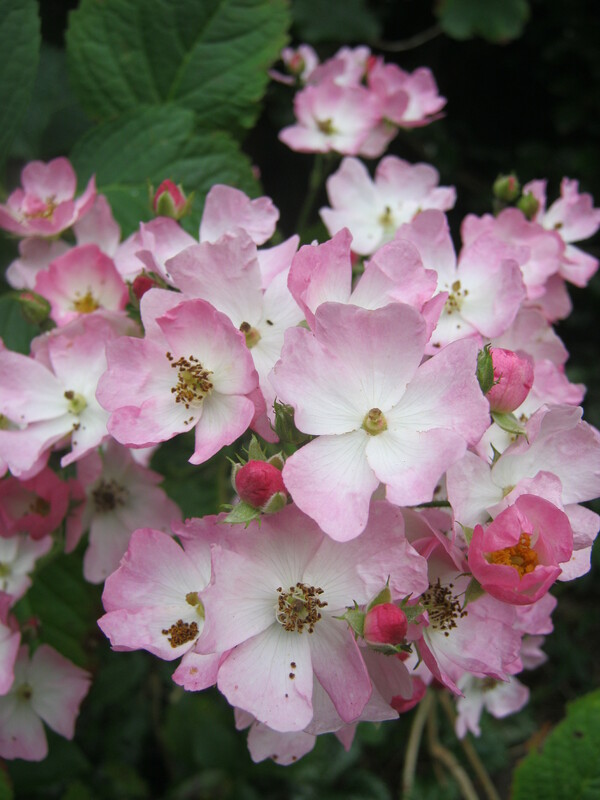 This year seems to be an exceptional one, the weather is good so the blooms are not being damaged by too much rain. William Lobb one of my all time favourites. This fades to a soft grey/lavender with a lovely perfume. The buds are covered in a perfumed moss. Lady of Shalott a Mothers Day present from my daughter a few years ago. 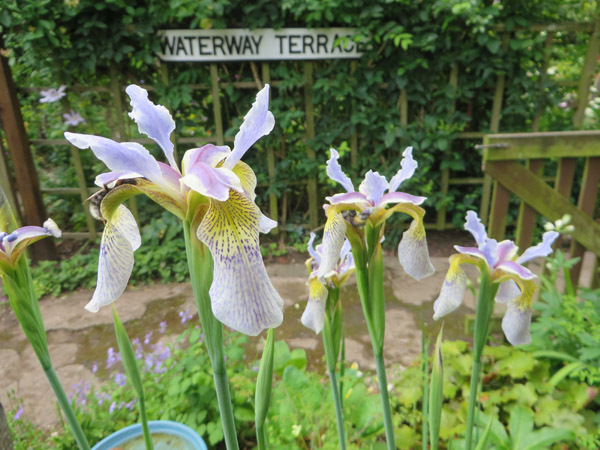 Now looking splendid amongst a dainty white iris and a pale purple viola cornuta. Rosa Moyesii a rose I have had for many years now and as you can see there is a hip starting to form at the side of the bloom, but I know it will drop off. 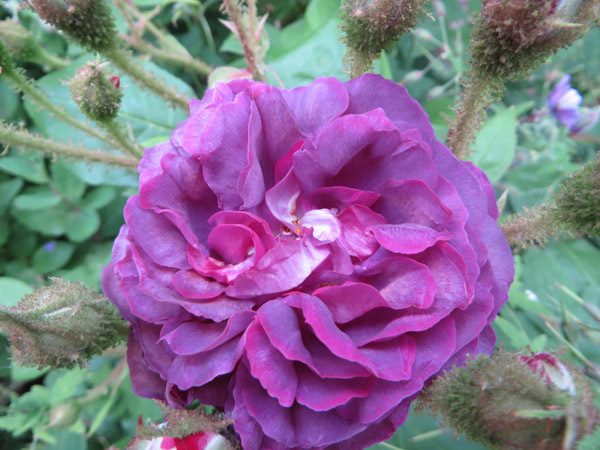 In the 20 plus years I have had this rose not one hip has managed to form properly. !!!!! Madame Hardy now looking a little sparse as the wisteria is covering most of the growth. A rethink needed. 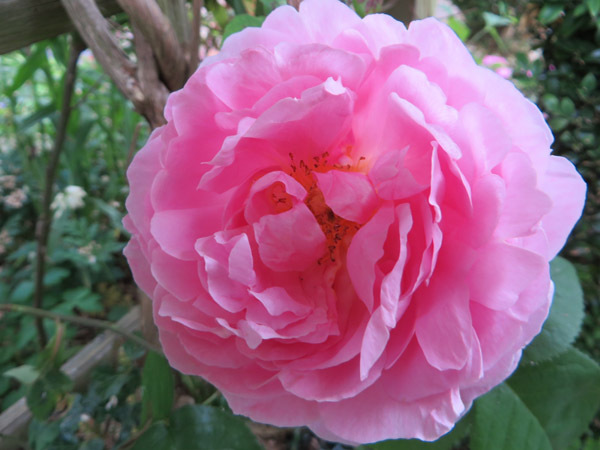 Ispahan a wonderful rose. 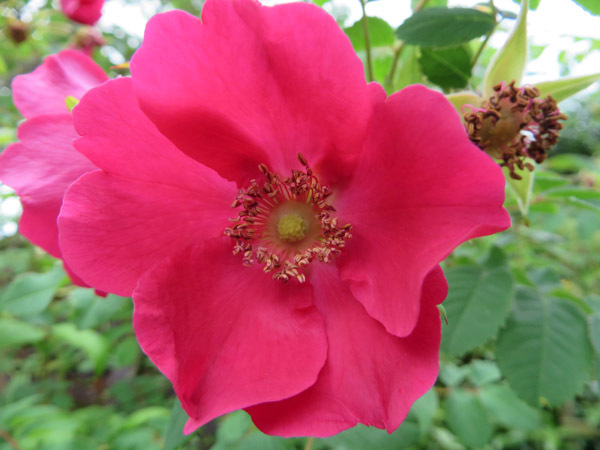 Healthy strong, full perfume, long flowering season. 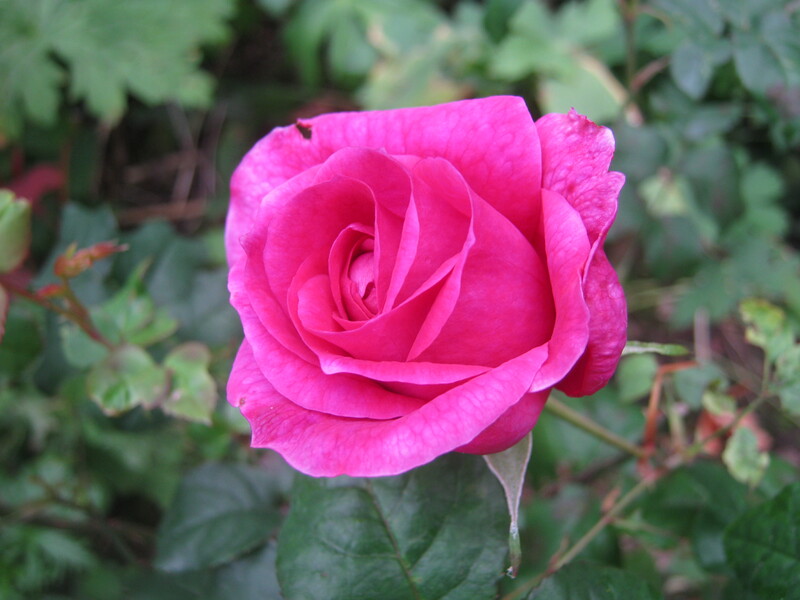 What more could you ask of a rose. 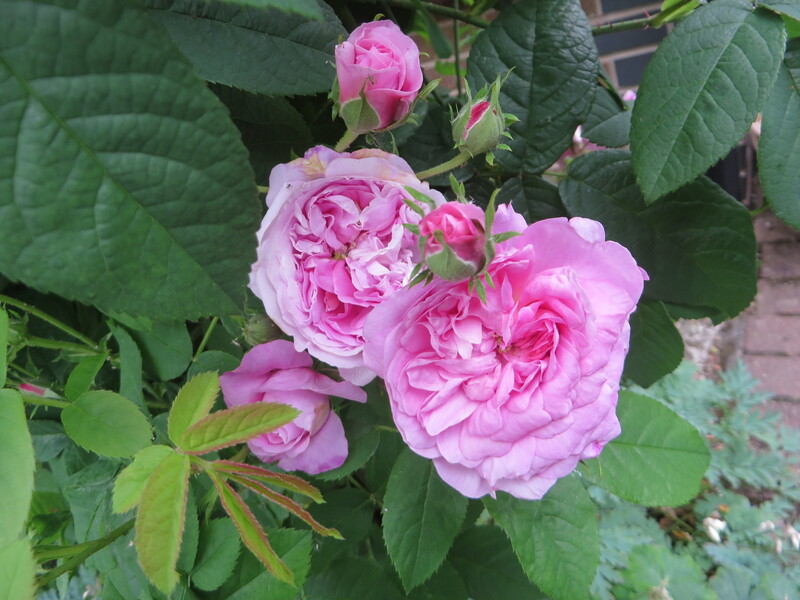 Constance Spry a once flowering lax shrub or climber, has wonderful perfume and large full blooms. 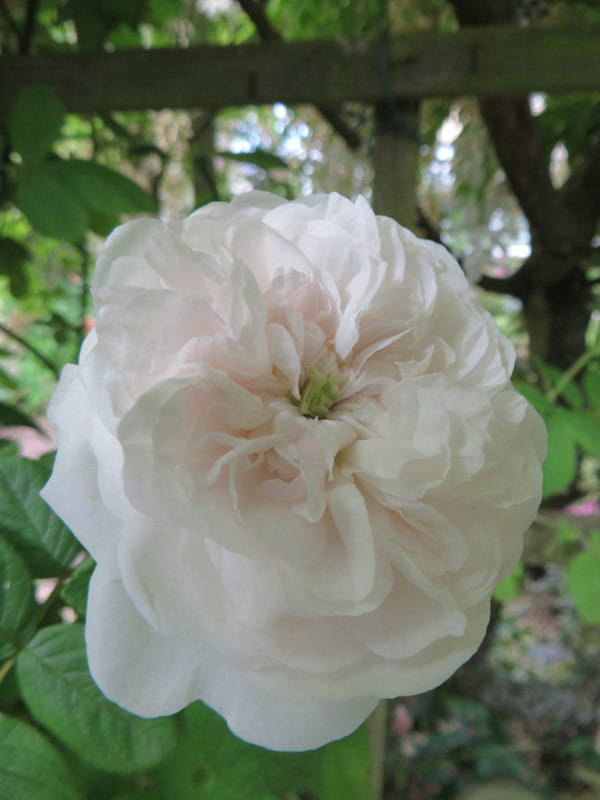 Cornelia a lovely rose from start to finish, pretty buds opening a coppery/apricot fading to pink, excellent perfume. Picture does not do the colour justice. 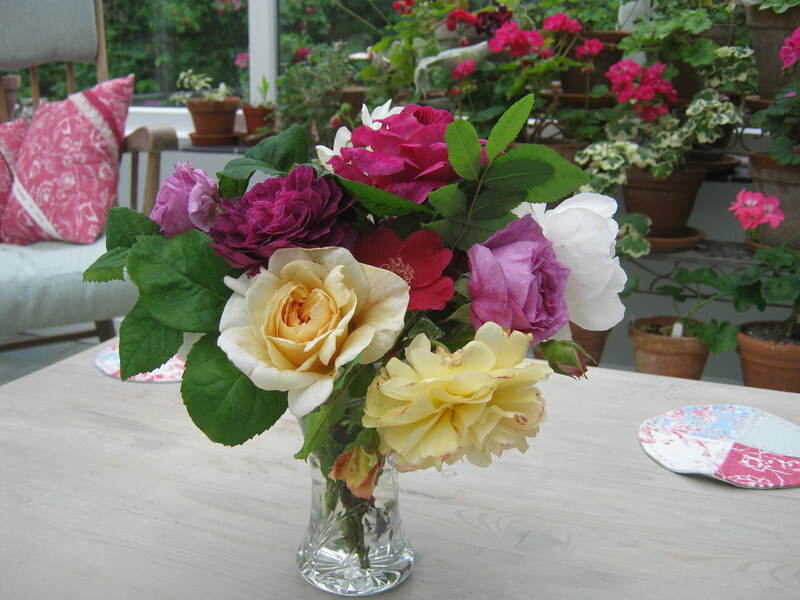 I hope you like the small selection of plants and roses now flowering in the garden. I could bore you to tears with the roses but I will stop now. And finally, I got the total raised at the open weekend, it came to £3700 not bad considering how awful the Saturday was. We have all received our share of this based on the number of days we opened. All of our chosen charities have now benefited from everyone’s hard work. Will I do it again next year …never say never. Blooming rain….Vase on a Monday. This is my contribution to Cathy’s Vase on a Monday post. Cathy from Rambling in the Garden. We had dinner with my sister Jen and her husband yesterday and this was my table centre, hope it qualifies. 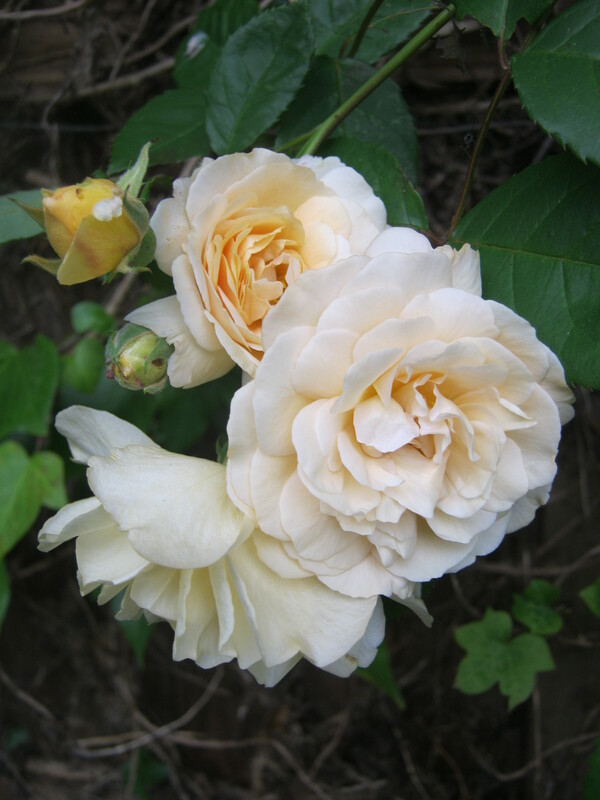 Roses include …Buff Beauty, Tour de Malakoff, Sweet Juliet, Belle de Crecy and Moonlight.